Every year at the end of April, like clockwork, tensions rise between Morocco and the Polisario Front, the group leading the disputed region of Western Sahara’s independence movement. The timing coincides with the U.N. secretary-general’s annual report to the U.N. Security Council on the latest developments in the conflict, which is followed by a vote to renew the peacekeeping mission—known as MINURSO—that has been in place in the territory since 1991. Whether by pushing to include human rights monitoring or by encroaching upon the buffer zone, it has become the norm for the parties involved to try to shift the status quo in their favor in the weeks leading up to the vote. This year is no different. On Apr. 1, Moroccan officials convened an extraordinary parliamentary session to evaluate measures in response to what they called Polisario’s “provocations” in the buffer zone, just beyond the perimeter of Morocco’s nearly 1,700 mile (2,700 kilometer) wall that runs through Western Sahara. As per the 1991 U.N. cease-fire agreement, Western Sahara is divided into five areas, one of which includes a 3-mile-wide buffer zone just east of the wall where any military presence is restricted. Falling just short of announcing military measures, official sources were quoted in Moroccan media saying that “no option is off the table,” suggesting that the cease-fire would be broken. These developments were further compounded by reports that the U.S. Department of Defense had approved a shipment of 62 tanks to Morocco. 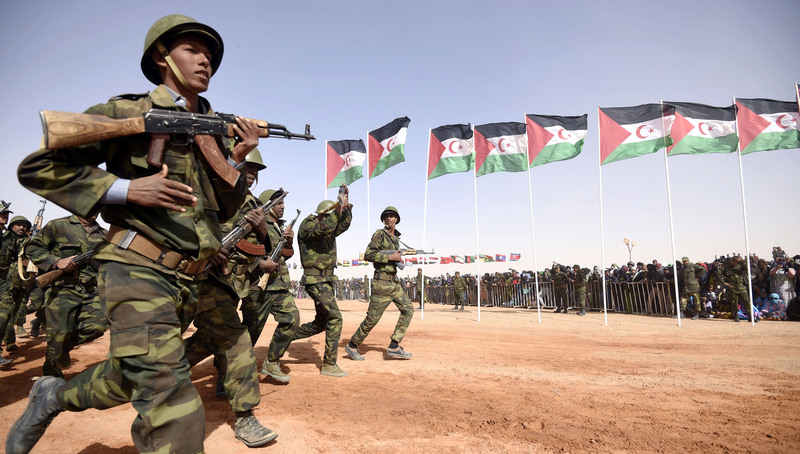 In response, Polisario officials echoed the forceful tone of Morocco’s statements, also affirming that “the Polisario Front is in the utmost readiness to respond to any Moroccan move to undermine or change the status quo in the liberated territories.” Meanwhile, the U.N. has contradicted Morocco’s statements, stating that MINURSO has not detected any Polisario military movement in the buffer zone. Nevertheless, reports began circulating in the Moroccan media about the Moroccan army carrying out reconnaissance flights in the territory. Others pointed to Algeria—which supports and hosts Polisario—as the primary instigator. While the conflict appears to have reached an impasse, a few recent developments have pointed to Polisario’s leveling of the diplomatic playing field. Earlier this year, the European Court of Justice ruled that any fisheries agreement between Morocco and the EU would only be valid if Western Sahara was excluded, a major win for Polisario, which has argued that Morocco’s international agreements cannot include resources from the territory because it had not properly sought the consent of Western Saharans to extract and export their natural resources. And just last month, a South African court placed a 55,000-ton phosphate shipment up for auction after the cargo was seized for having been extracted from the Western Sahara—another win for Polisario. Moreover, the recent appointment of John Bolton as national security advisor to U.S. President Donald Trump has sown anxiety in Rabat, given his previous work organizing and supporting a referendum on the territory’s independence, an avenue Morocco has largely shunned. Morocco’s anxiety was further heightened after a Republican Party lawmaker thwarted the administration’s move to appoint J. Peter Pham as assistant secretary for African affairs at the Department of State, citing his vocal support for Morocco vis-a-vis the conflict as a cause for concern. In light of these recent developments, Morocco might have cause to beat the war drums in a last-minute effort to mobilize diplomatic support ahead of the Security Council vote this month. According to some reports, what is largely driving Morocco is its ambition to push Polisario out of its already-confined presence in the territory east of the berm. However, any military force deployed for such an effort would likely solicit a strong international reaction for defying the cease-fire agreement. In other words, these hollow war drums have fallen on deaf ears. If anything, the U.N. envoy for Western Sahara Horst Kohler has made strides in encouraging the resumption of talks, sending out invitations in January to officials from Morocco, Algeria, Mauritania and Polisario for talks in Berlin. Ultimately, what gets lost in this war of words is that the livelihoods of nearly 100,000 Sahrawi refugees are at stake. Since 1975, these refugees have experienced the harsh realities of displacement in camps scattered across southwestern Algeria. As the conflict has endured with no end in sight, developments on the international stage continue to shape the daily realities of the generations that have ended and begun in these camps. Recent developments point to Polisario leveling the diplomatic playing field.